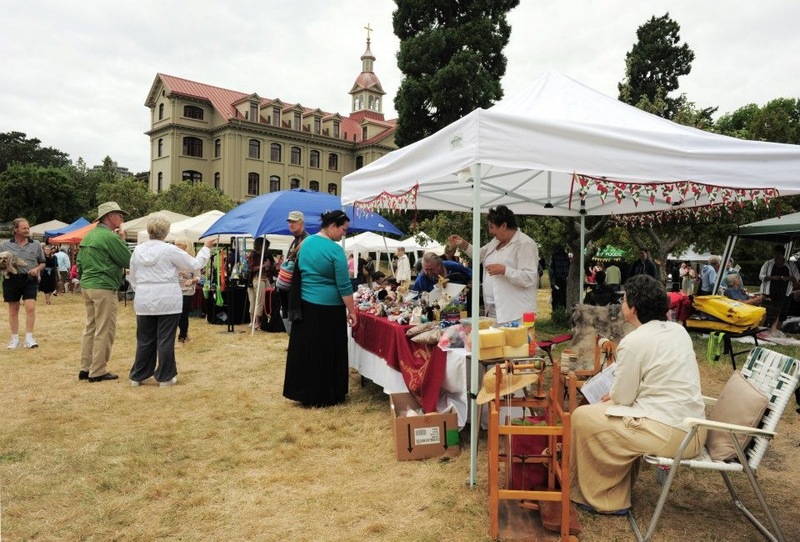 Guests strolling the grounds at historic St Ann’s can browse, shop, learn and create. There is a Marketplace filled with hand-crafted items by local artisans. Curious about process and products? Ongoing demonstrations of knitting, weaving, spinning, crocheting and felting invite your participation. 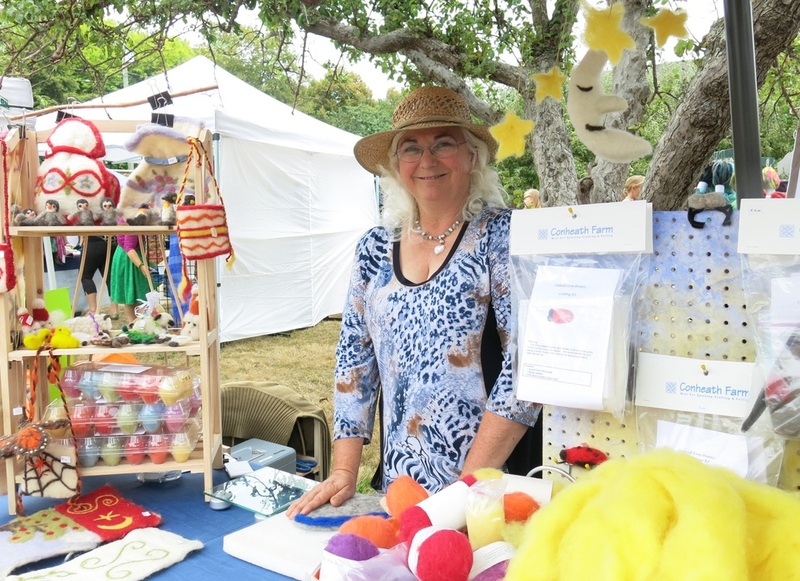 Knotty by Nature Fibre Arts is an award-winning family business located in Fairfield. 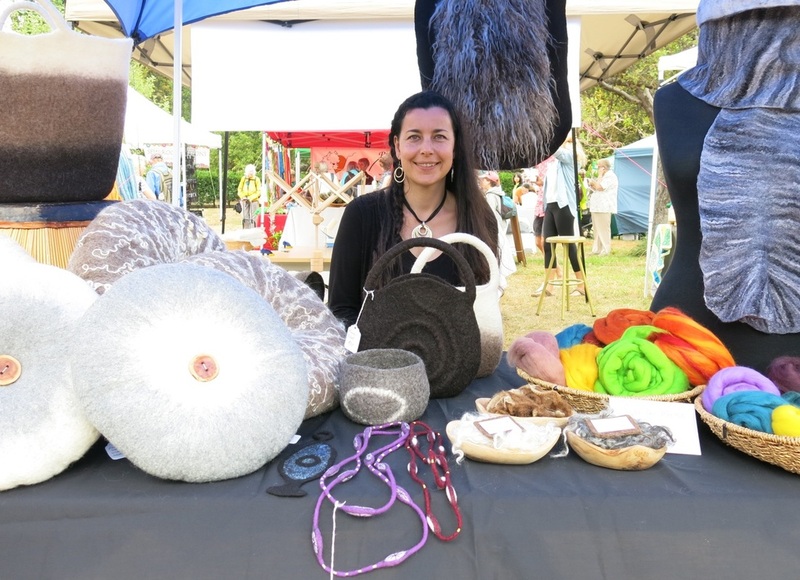 Stephanie Papik and Ryan Davis sell supplies and conduct courses on spinning, felting and knitting. The organizers are delighted by the growing success of Fibrations and super team of volunteers. “This year we have 50 confirmed vendors, four guilds and several food booths,” says Ryan. A toonie raffle includes many treasures. 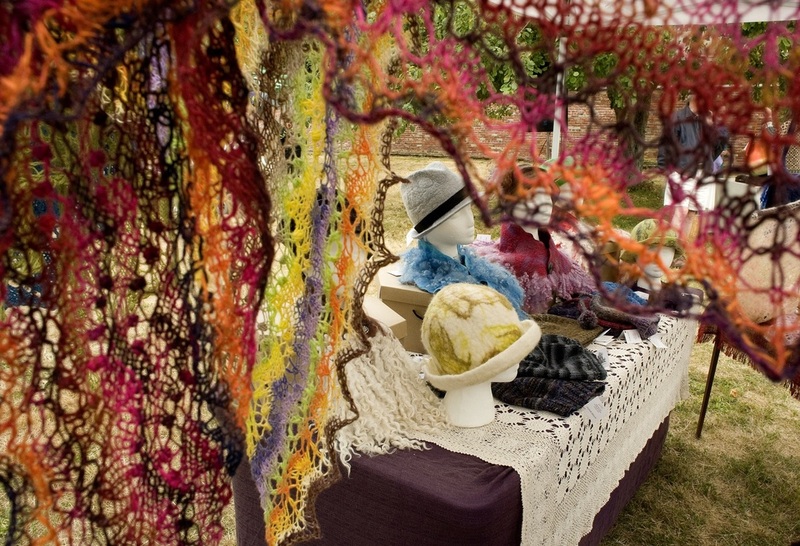 bring a variety of wares to Fibrations, including wool rovings and sheins of yarn in bright jewel tones. Undyed wool in natural shades is also available. Many colours and sizes of hand-dyed rovings. 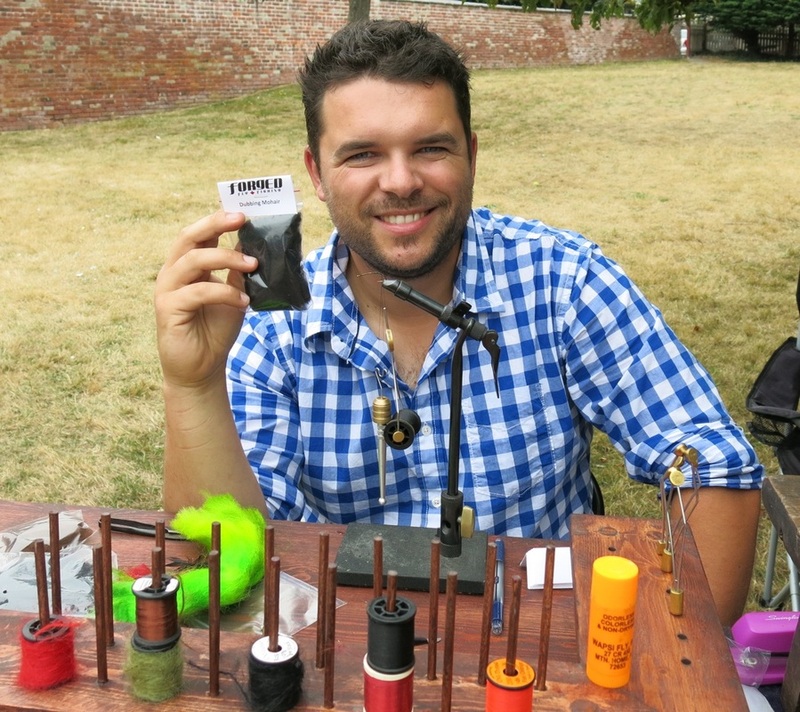 “Fibrations is my favourite sale of the year,” says Devon. Devon gets creative inspiration from the other vendors in the outdoor venue. Chatting with guests and connecting with customers are other highlights of the day. Knotty by Nature was one of Humming Bee's first customers, and they appreciate how Ryan and Stephanie support local farmers. Mother Angora goat with newborn kid. The farm's Suffolk Southdown sheep rovings are nature’s version of machine washable wool, and are very popular with customers. Hand-dying the Mohair wool creates bright jewel tones seen at right, hanging to dry. Saori weaver Terri Bibby lives on Salt Spring Island. Terri hosts weaving workshops and retreats in her home studio. A traditional weaver for 20 years, she embraced the Saori method and philosophy in 2005. The gift of Saori comes in the freedom it gives, she notes. "People can just let go and enjoy the colours, textures and meditative rhythm of the loom." at the upcoming Fibrations Marketplace. Part of the Saori philosophy is learning and growing together. 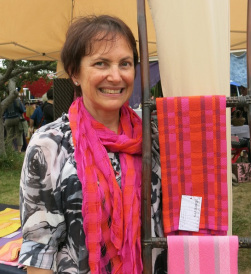 The Saori Peace Weave, a community weaving, was recently sent from Salt Spring to Hiroshima. “The weaving was a great undertaking using local people and fibres,” says Terri. Carolyn Knight is Community Artist in Residence at the Fairfield Gonzales Community Association. At Fibrations, she'll engage community with an Eco-arts Project called “Through Fairfield Seasons”. Fibration guests can weave with invasive species (English ivy, blackberry and bind weed) while learning about our local Garry Oak eco-system. The free-form panels (below) serve as decorative garden pieces or protective barriers. In the large park that Fairfield Community Place shares with L’Ecole Sir James Douglas, a community garden site is underway. Local food and habitat security is a key focus. Carolyn looks at seed pods of a mature camas plant in Robert J. Porter Park. Victoria sits on the traditional territory of the Lekwungen people, who harvested camas as a dietary staple and trading item. Funding from the BC Arts Council is gratefully acknowledged. Tierre Taylor studied millinery at George Brown College. Hat-making highlights her skills with fashion, design and textiles. Tierre creates visual drama with luxurious fabrics and terrific textures, designing hats that are sophisticated, mysterious, jaunty and playful. The millner (maker of hats) relishes an event like Fibrations to showcase her ingenious collection of headgear. “I’m excited to return to the orchard setting, filled with colourful creations and enthusiastic people." Because hats require so little fabric, the millner can choose quality materials and exotic accents. She enjoys exploring certain shapes and refining her product lines. Brenda learned how to Rep Weave at a recent conference in Bellingham. Brenda believes that fibre arts are a vital piece of life. At Fibrations, Guild members are happy to help people weave some cloth. The Guild holds regular meetings to share techniques and welcome new members. Laura has a background in computer science. She notes the simiiarity of computer programming with the operating process of a loom. Every weaving pattern is planned by a series of 1’s and 0’s (or ups and downs) much like a computer program. A weaving pattern printout looks like matrix arithmetic. “It’s the same thinking process but using different mediums,” she says. Laura Proctor demonstates a hand-turned drum carder. At Fibrations, guests can crank the handle and card some wool. The carding process staightens the fleece fibres and removes debris. The carded wool is now ready to spin into yarn. in 1784 in Birmingham, England. Beatrice Keizers-Clark greets visitors at info table. Ken Dunn and his late wife Denise were pioneers in Victoria’s Flax to Linen movement. “I enjoy the sense of community involvement,” he says. Ken is shown hackling the flax to produce finer and finer gradations of fibre. As an educator, Beatrice delights in sharing information and involving children. Barb Rimmer refines flax fibres with a rotary break machine. Furniture design students at Camosun College used computers to configure the precise wooden gears. Barb’s photo book chronicles the group’s 100 day journey from seed to harvest. CROWDS ARRIVED EARLY TO ENJOY THE FESTIVE EVENT. Denise de Montreuil spins lace weight yarn from the wool of Bluefaced Leicester sheep. Heather Thurston from Fibre Antics makes fine art creations. See more at fibreantics.ca. Johanne Byskov from the Victoria Handweavers and Spinners Guild, weaves a willow basket. 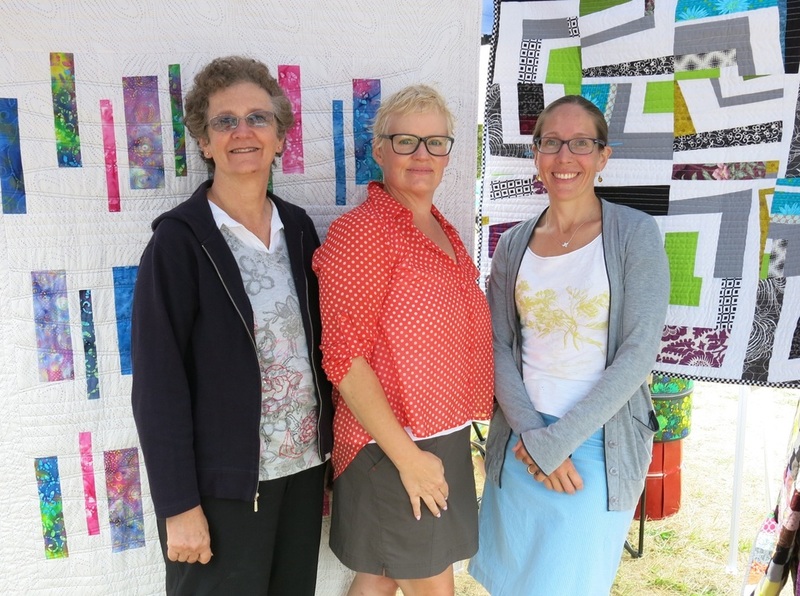 Members of newly formed MODERN QUILT QUILD OF VICTORIA. From left: Brenda George, Jo-Anne and Nicole Hannah, president. Our heartfelt thanks to everyone who contributed to the stellar success of Fibrations 2013! 18 years at Boulevard magazine. Kate Cino (right) with daughter Rachel at Fibrations 2013.